It was a Tuesday in early September and Oluwole Betiku was spending the afternoon with his mother and older sister. Ordinarily, a visit like this might not mean much for a player who graduated high school just 11 miles away from USC at Junipero Serra High School in Gardena. 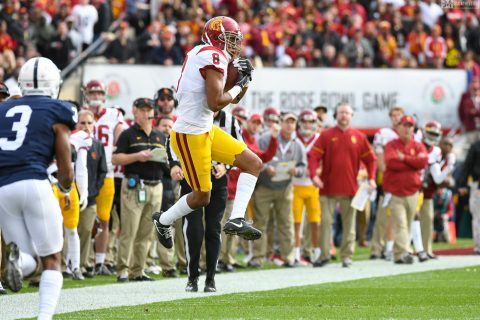 There are eight Cavaliers on this year’s USC football roster. Seven grew up within 20 miles of the USC campus. Betiku, a sophomore linebacker, is the exception. He is an ocean and a continent removed from his hometown of Lagos, Nigeria, a place he last set foot in four years ago. That makes this reunion an especially important one. It is the first time Betiku has seen his immediate family since he left home at age 16. So, too, is the journey that brought him to Troy. Ever since he was old enough to set goals, Betiku dreamed of leaving Africa. Growing up in Nigeria, you’re taught to dream of greener pastures outside the country. “Growing up in Nigeria, you’re taught to dream of greener pastures outside the country,” he said. He remembers the adulation bestowed upon community members who went elsewhere and returned, the respect and prestige they earned for the courage it took to experience something new. To Betiku, they may as well have come home as conquering heroes. “All my life, I just wanted that for myself,” he said. More than anything else, “that” meant America. He knew it only through popular culture, but even those brief flickers touched his imagination. He saw how buff the rapper 50 Cent looked in music videos, so he began to go to the gym and lift weights. He watched movies like American Pie and Mean Girls and wondered what it would be like to go to high school in a place where a band played during sporting events and cheerleaders danced on the sideline. The problem was getting there. He was a skilled basketball player but nowhere tall enough for a chance at a pro career. Betiku regularly wandered the streets of Lagos searching for pickup games, though, and it was during one such trip in 2013 that he caught wind of an opportunity. Ten hours away in the town of Uyo, a former University of Maryland linebacker named Ricardo Dickerson was holding a clinic in search of potential football prospects. Those who excelled would be placed in American private schools under the care of host families. Betiku had never even heard of American football, much less played it, but it hardly mattered. He hopped on a rickety bus and did his best to get through a battery of exercises ranging from traditional football drills to lifting cinder blocks. He impressed enough to be accepted into the program, only to face one last hurdle: Securing a visa. He knew going in that he had no better than a 50-50 chance at receiving one, so he showed up to his interview at the American embassy in Lagos two hours early. “I knew so many other athletes who have tried to take this route and they got denied at the embassy and stuck in Nigeria,” he recalled. Twelve hours later, he was officially approved. “It was the biggest moment of my life,” he said. That November, he boarded a plane bound for Washington, D.C., and his new legal guardian, former NFL Pro Bowl linebacker LaVar Arrington. Less than a year later, as a high school junior, he was on the move again when Arrington accepted a television job in Los Angeles. Betiku enrolled at Serra, which in recent years had gifted USC All-Americans like Robert Woods, Marqise Lee and Adoree’ Jackson. He was nowhere nearly as well-regarded, at least not at first. He had yet to participate in an official game and the growing pains were evident. He remembers jumping offsides as many as five times in a game, and he struggled to squeeze his muscle-bound frame enough to sell his coaches on letting him play without shoulder pads. 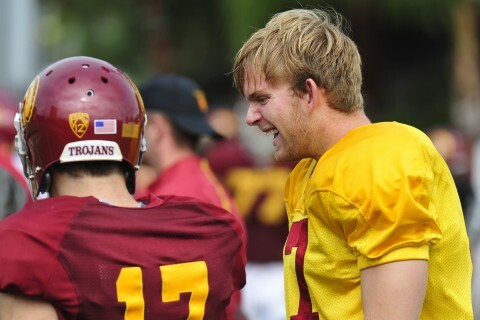 His potential was obvious, however, and it wasn’t long before a Serra coach informed USC offensive coordinator Tee Martin that there was someone he needed to see. Martin made good on his word and stayed in hot pursuit during Betiku’s senior season, when he recorded 17 sacks and established himself as one of the top recruits in the country. But Betiku’s story captivated the coach even more than his ability. At USC, it’s not just going to be about football. It will be about everything around you as a human being and helping you having a success story out of this. Betiku enrolled at USC in January 2015. He was aware of the university’s academic opportunities, as well as its football legacy. But USC’s foremost appeal was something he thought he’d left behind 7,000 miles away: a feeling of home. A major reason why is the university’s expanding community of Nigerian athletes. There are five players of Nigerian descent on the football team alone, something that Imatorbhebhe, whose brother Daniel also plays on the team, said is no accident. 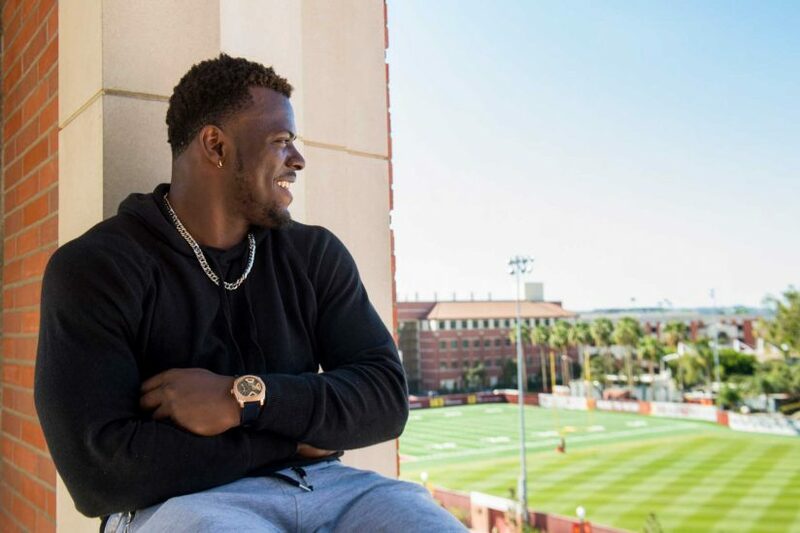 For Betiku, it is a special family within the Trojan Family. Imatorbhebhe’s mother comes from the same tribe as Betiku’s mother and has dutifully kept a watchful eye on him. He calls senior linebacker Uchenna Nwosu, another Nigerian-American, his best friend on the team. He frequents both families’ homes for dinners, where he loads up on his favorite Nigerian dishes like Egusi soup. “It helps a lot, having them around,” he said. Yet nothing compared to seeing his own family again. He craves the day when they’re reunited in full back in Nigeria. He’s dreamt about the moment for years, but said he’ll only go back on his terms. “I want to return a king,” he said. He imagines a throng of children around him, wondering about his experiences the same way he would have at their age. He’ll share all of them and more. A dream comes true as the long snapper takes the field during USC’s win over Western Michigan, and leaves his mark on the scoreboard. 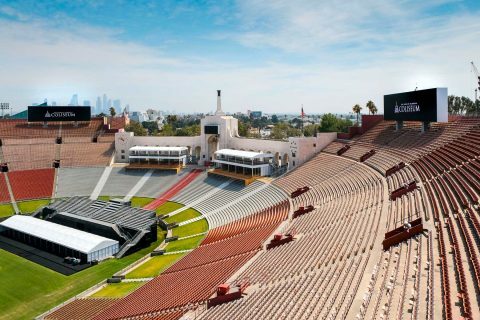 Fans will notice a few small changes — and two huge new scoreboards — when the Trojans face Western Michigan in Saturday’s opener. The Trojans open the season with a three-game home stand against up-and-coming Western Michigan, Pac-12 rival Stanford and longtime adversary Texas. Rose Bowl champs open season with home games against Western Michigan, Stanford and Texas.